Safavieh rugs are beautiful and durable and a wool rug adds a luxurious touch to my home. I have bought this style in several sizes for my living area. The colors are a bit darker than the rug appears on my screen, but they worked well with my color scheme. I am pleased with my purchase. Dimensions 2 ft. 3 in. x 4 ft. This is the fourth rug that I have purchased from Overstock . The rugs are thick and beautiful. The colors and designs are far above what I would expect at this price. The only problem has been shedding but each rug has improved over time. After 4-5 vacuums , they shed a minimal amount. This is a beautiful rug. Very thick pile and tight weave. Perfect for my entranceway. This is a high end rug and sells for much more at other places. This wool rug is stunning ! I ordered a large size to go under my dining room table to further impress my guest. 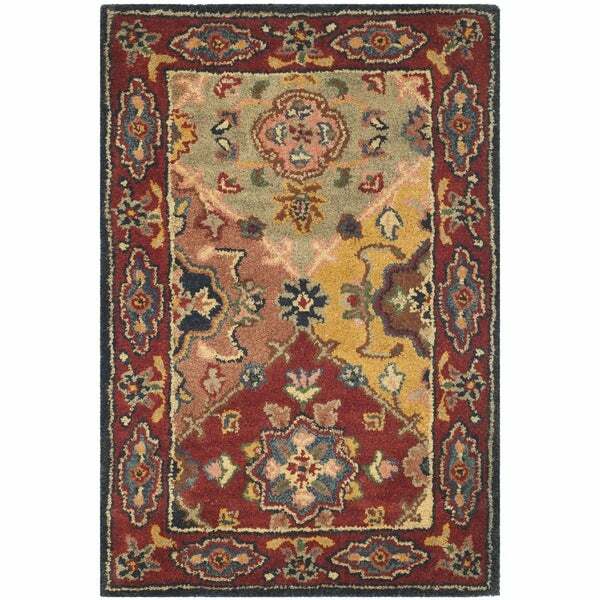 The colors are deeply rich as well as the feel of the rug.. it's a must have ! Beautiful wool rug at a great price. It is very well made and has gorgeous colors. We purchased two of these rugs for our foyer, and one slightly smaller. The colors are not as bright as they appear on our computer screen, hence only four stars. However, they are still nice rugs, very thick, and they vacuum well. I love the quality of my rugs! Beautiful deep rich colors. Thick lush pile lends an expensive feel to a very inexpensive Overstock deal. So happy with this rug! We now have 4 of these rugs through out our home. The colors are warm and earthy and add to the wood floors a cushion unexpected for the price. Beautiful rug, colors and quality. Excellent price. It was a great addition to my hall way! Very beautiful and very good quality rug! 100% satisfied! Colors are a bit darker (especially the yellow/gold part). Loved it so much, I came back for another one. They match perfectly to the 8’ round with the same pattern in my living room! I am very pleased with the quality and design of this small carpet. It fits just right in the space for which it was intended and coordinates well with my other carpets and furnishings. I am interested in buying a 9 by 12 rug but wanted to see the actual colors first. So I decided to purchase the coordinating mat first. Like the colors and material. It coordinated with the 8x8 I choose for my living area and was wool.